The vast majority of photography revolves around the unary mode: each person, thing, event has to be represented by exactly one picture. In other words, as a photographer you go out to photograph a person, thing, or event, and before the world sees what you saw you spend time in your studio to reduce everything down to that one picture that… Well, what? What exactly does the one picture do? In light of the world’s complexities, reducing something down to one picture is a gross oversimplification that, however, is not without its merits as the history of photography demonstrates. This history also contains examples of photographers straying from the single-image idea, starting with, let’s say, Eadweard Muybridge and then moving through the ages here and there in a variety of ways up until, Paul Graham‘s A Shimmer of Possibility or Sandi Haber Fifield‘s After the Threshold. Even these latter two artists cannot fully move away from the idea of the single image, as their presentations make clear. For example, Graham’s Shimmer vignettes each are hung in an exhibition as clusters of carefully and individually framed photographs. In contrast, the vignettes in Threshold revolve around very specific and equally carefully selected images. These artists thus expand the idea of the single unique picture without being able to fully untether themselves from it. In a different way, graphic designer Yoshihisa Tanaka and the sculptor Ryuta Iida (who form the duo Nerhol) attempt to circumvent photography’s single-image limitations. Using a large number of individual portraits of a person, taken over the course of a few minutes, they produce what many people would probably describe as a sculpture that, however, when presented ends up as an individual single photo again (find their process described here). In yet other ways, artists such as Barbara Probst or Andrzej Steinbach have been exploring photography’s seemingly inherent focus on that one picture. To this end, Probst constructs often very elaborate multi-panel installations, where each individual picture shows the exact same situation, albeit from a different angle and possibly with different means. Where Graham dissolves a short moment into a burst of individual images, Probst does the same for the idea of the vantage point. Still, the end result yet again is a group of carefully framed prints. It is Steinbach who gets close to what I’m after here. Seemingly doing away with the idea of editing, he presents photographs of, let’s say, a single person none of which on its own appears to have any more relevance than any of the others (the artist has employed his technique also with smaller groups of people). A viewer very familiar with photography’s standard approach for dealing with pictures will inevitably get confused when s/he is presented two photographs that appear to have been taken in rapid succession: should there not be a choice made, picking one picture over the other? What does it mean to look at two, especially when they’re so similar? This is where things get interesting. 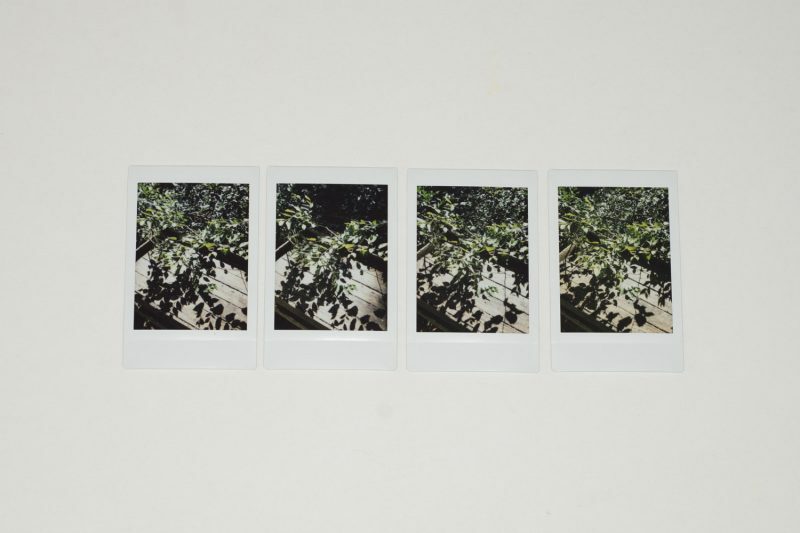 It’s still photography, yet it subverts our expectations — and that’s what I’m after here. Who says there cannot be new things done in photography? New, I should add, not for the sake of its newness — that would quickly become tedious — but rather to explore what photography can do when you do away with some of its (at times fairly arbitrary) restrictions. After all, would photography have moved so quickly towards the single image after its invention if painting or print making had never been around? It’s a nonsensical question, given that one of the reasons why photography was invented was exactly to circumvent the limitations created by the maker’s hands in painting or print making. So photographers treated their images like paintings (producing a single image) and prints (employing ways to mass-produce said single image into a set of identical copies, whether in ink or otherwise). One might imagine that once roll-film negatives was made available, artists would have embraced the fact that they could, in fact usually did, produce variants of the same picture. Those variants were what artists worked with, when they inspected their contact sheets. That embrace never happeend. As far as I know, even people as willing to push the boundaries as László Moholy-Nagy did not expand beyond the single-picture approach. Moholy-Nagy’s 60 Fotos is filled with daring ways to explore photography — some so visually exciting that they manage to inspire my students to this day. But in the straight photographs, it’s the single picture that matters (in some of the montages, picture fragments might appear multiple times). Maybe it was the presence of movie making that got in the way. After all, what are movies other than collections of very large numbers of picture variants that, however, the viewer gets to see one after the other? It is interesting to note that Muybridge at times strayed from — or maybe went beyond — what he is known for. I own a copy of the third edition of his The Human Figure in Motion (which carries the great subtitle An Electro-Photographic Investigation of Consecutive Phases of Muscular Action), printed in 1907. After 172 pages of the multi-panel displays that he is so well known for, there is a second section in the book, Miscellaneous Phases of the Human Figure in Motion. In that section, parts of the panels shown earlier are enlarged, with small groups and occasionally a single photograph. This section does not quite get into A Shimmer of Possibility territory, but at times, the rigid scientific approach of the multi-panel presentations is broken up enough to hint at the actual power of the photographer’s work. I usually refer to photographers’ usual insistence on picking a single image, the single image, as the Precious-Picture Complex. As I noted, there is a validity to this approach: the moment you reduce a complex situation, event, or person to a single photograph all kinds of things can happen. Those can be good or bad. For example, we are so used to knowing of what we call iconic photographs that we don’t question them any longer. In fact, parts of photoland debate which one of the pictures around some event is likely to become the iconic image, the one image that gets to stand for how the event is perceived. This approach is understandable, especially in light of what I discussed above. But it also runs the risk of simplifying things too much, of creating too simplistic an idea around something or someone who is a lot more complex than one single photograph could possibly convey. So the simplification is not even just the selection of a single picture. It also is our own taking that single picture at face value, tossing aside what we know photography is and does: a highly selective process that always simplifies whatever is in front of a camera lens. As I already mentioned, it doesn’t have to be this way. Steinbach’s approach might strike some as being overly arty (I don’t think it is), but even going back to some of the history of photography will unearth examples of photographers pushing beyond the Precious Picture. The above is just one spread from David Douglas Duncan‘s 1969 Self-Portrait: U.S.A., a book that for a variety of reasons deserves a lot more attention than it actually gets (given that the book hasn’t been written up by the makers of any of those photobook meta books you can get a copy for around $10 online). 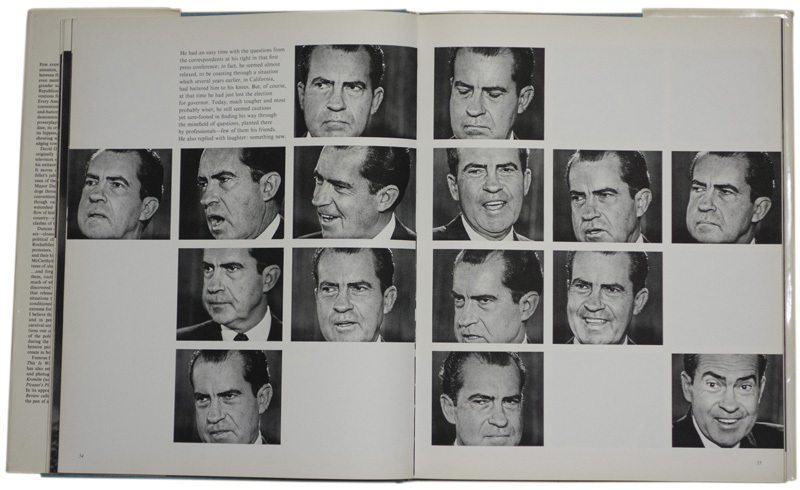 In that spread you have 15 tightly cropped photographs of then presidential candidate (and later presidential crook) Richard Nixon at a press conference. In fact, there is a little section in the book that covers that press conference, and each spread works with these multi-panel layouts. The result is effective and impressive: no single photograph would have been able to describe this (and, let’s face it, many other) politicians’ mastery at manipulating an audience as well as embracing this multitude of photographs — all taken within a relatively short time span. So the single photograph, the Precious Picture, has its uses. But especially given the times we live in, where photographs are used and misused so frequently that our first instinct is to check first whether a photograph is real or in the proper context before reacting — in such a time, maybe moving away from the insistence of the single photograph can help revert some of the erosion of trust in this particular medium. Seen that way, we’ve almost brought photography’s crisis of credibility upon ourselves, by unnecessarily reducing it to its simplest incarnation, an incarnation that’s filled with problems and that is almost begging to be abused. But we can also help solve the crisis. This might mean that we have to abandon some of the ideas we hold so dearly when it comes to photography, in particular our insistence that everything — every situation or person — has to be represented by a single picture and only by a single picture. If you enjoyed this article, please consider visiting my Fundraiser. Reader support helps sustain this site. Thank you!